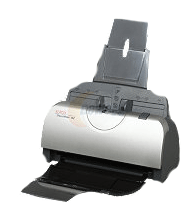 Multi-page scanner for scanning documents into PDF and Word files. Available at DMC stations: 13 and 16. If the document has regular font size 12 pt. or higher, use B&W 200dpi. If the scanned documents need to be OCR-ed, B&W 300dpi (preferred) or B&W 600dpi, either setting will work. Run OCR : Click on Tools > Recognize Text, choose "In This File".